I grew up in Downey. My parents bought their first (and only) house in Downey in 1950. (See Post-WWII housing boom.) But when they first got married, in 1946, World War II had just ended and it was impossible to find a place to live. 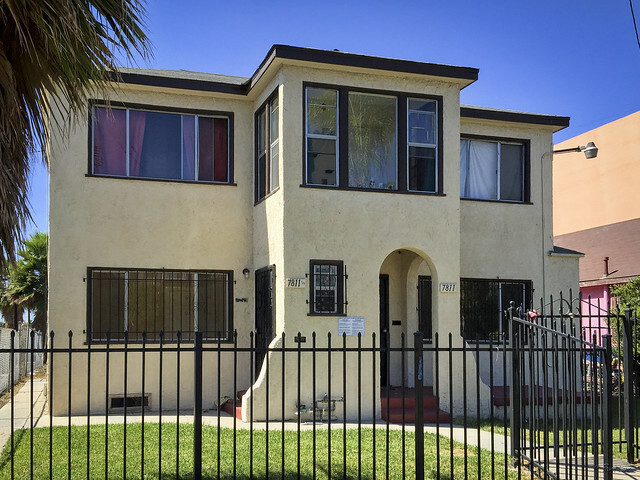 So, for the first couple of years of their married life, they lived in this second-story duplex in downtown Los Angeles with my mom's parents. The G.I. bill paid my dad's tuition and books plus provided some additional money for living expenses. That, with my mom's job and her parents taking care of my brother, made my dad’s schooling possible. All this I learned a few weeks ago when the family was together and took a drive through the old streets of Los Angeles. My dad immediately remembered that upper patio room where my grandfather sat and played with my brother. It's fun that it's still there, nearly 70 years later.